Rossport Solidarity Camp tempoRARily thwarted Mayo Co. Council’s attempt to secure a permanent injunction at Castlebar Circuit Court today. Judge Harvey Kenny adjourned the case to next Tuesday 31st of July to give members of the camp time to seek legal advice. 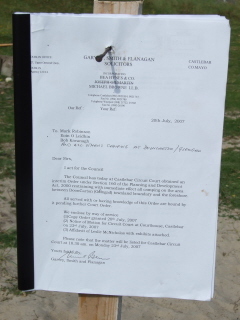 Mayo County Council was refused an interlocutory injunction against the camp but an interim order was upheld. The council has undertaken to not to act on this order while the case is adjourned. Earlier this morning members of the Rossport Solidarity Camp and several local supporters arrived at Castlebar Circuit Court on foot of a Court Order issued by Judge Donagh McDonagh last Friday 20th of July. This order cited Rossport Solidarity Camp was an unauthorised development in a Candidate Area of Special Conservation. Eoin O’Leidhin was the only one of the three people named on the court order present at the hearing. Mayo Co. Council was granted an application to have Niall Harnett added as an extra respondent/defendant to the injunction when he submitted a statement representing the camp’s position. Judge Harvey Kenny put the case back to the afternoon so that members of the camp could consult with the Co. Council representatives and their solicitor Michael Browne. When the court reconvened, John Kiely JC, outline the councils case. Mr Kiely stated that the camp has caused “irreparable damage” at the site and that the camp was “an unauthorised development” contRARy to the Planning Act of 2000 section 160. He informed the court that the council’s decision to act was due to a report from Karen Gaynor of the National Parks & Wildlife Service (NPWS) and not because of “greater and better” issues regarding the camps participation in the Shell to Sea Campaign. Mr Kiely countered Niall Harnett’s argument that the council failed to give warning [of the councils intention to seek eviction] stating that “this is a nullity under section 3” of the Planning act. Speaking about the residents of the camp Mr Kiely stated that they were “genuine protesters and conscientious objectors to progress”. He acknowledged the many precautions taken by the camp to minimise the footprint of the camp but argued that had “Joe Blogs been in front of the court he would be treated the same way. He pointed out that the council had an obligation to enforce the planning laws and that the court “with a heavy heart” had to deal with many travellers in the same situation. 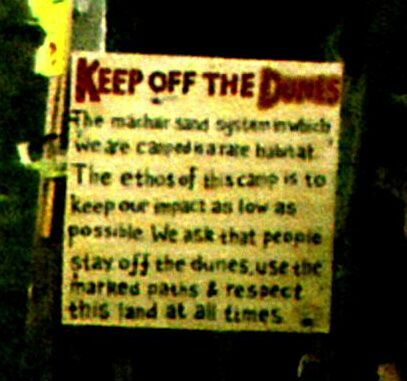 In response, Niall Harnett, who represented the Solidarity Camp, disputed the council’s claims of irreparable damage and that authorisation of the site was “implicit in the communication and co-operation between the camp and the NPWS”. Niall told the court that the camp had carried out the recommendations set out by the service. Niall referred to an independent impact statement that was included in a statement that he had earlier handed up to the Judge. 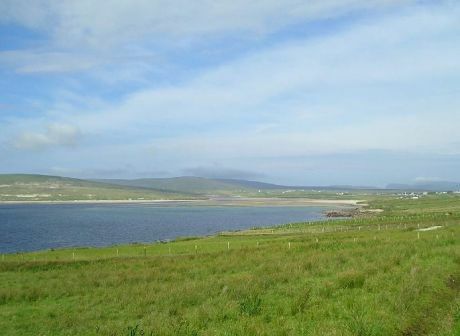 This report by, Bob Wilson, a director of Celt – Centre for Environment Living & Training and the Clare Biodiversity group stated that he is confident that the vegetation would soon take hold again. Taking issue with the urgency of the council’s action Niall told the court that the camp had just received the papers on Friday and that the camp had not time to seek legal advice. He pointed out that the council stated that they had expected large numbers to attend the camp at the weekend but numbers were relatively small at the camp over the weekend. In his argument Niall told the court that the camp had not been consulted or warned about the councils intent to seek a court order. Niall said, “that although Agenda 21 had not been ratified in law… it is council policy” and that consultation is a principle of Agenda 21. Niall also stated that the council’s solicitor Michael Browne had accepted that short notice was given. Niall then told the court that the order was inappropriate. Niall requested to read his statement in to evidence for the court but the judge told him that the important points were made and that it may take some time to read. 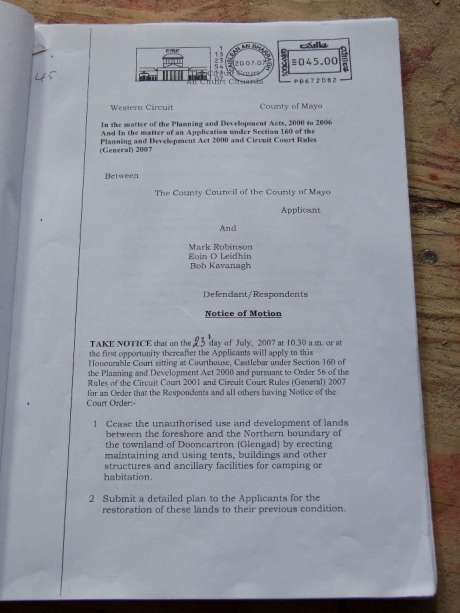 Niall accepted that the site did not have planning permission but told the court “it is a genuine claim that we didn’t know” that the camp “was not an authorised development”. Judge Kenny suggested that there was no getting over the planning permission barrier. In an act of goodwill Niall invited Judge Kenny to visit the camp. John Kiely JC assumed that Niall was making an application to adjourn the case and said that he could see the court giving “liberal time” to seek legal advice. He went on to question the credentials of Bob Wilson and reiterated the council’s position that the camp was an unauthorised development. Niall Harnett concluded that the “balance of harm was a test for any injunction” and that the harm to those living on the camp and would be greater. Judge Kenny agreed that short notice was given. Judge Kenny stated, “that they were entitled to some breathing space” but would not concede to Niall’s request to putting the case back to after the courts summer break. Before he rose Judge Kenny ensured that the council undertook not to act on the interim court order before the next court sitting. Judge Kenny adjourned the case to next Tuesday 31st of July 2007 when he will make his ruling on the matter. The Essence of Mayo County Council's Application. Click on photos to enlarge and read. campaigns and ignore the ten years of corruption (that now the Green Party are party to). and increased Health and safety risk to their children's children. Let the next generation know who used the offices of the legislation to sell them down the river. The basis of the complaint is apparently down to one small patch of ground where a tent was moved from and which has not yet regenerated with vegetation because it was not fenced off from people and cattle (the cattle do much more damage to the site than campers ever have). Apart from that oversight, the campers have done all that the National Parks and Wildlife asked them. The oversight is now being rectified by fencing off the bare patch. The camp was installed on this area of common land (perhaps use of this common land comes under ancient Brehon Laws ?) at the request of locals who saw the need for camping facilities to cater for the ever increasing numbers of visitors from around the world who come to find out what is happening. The camp is temporary with temporary residents and only temporary damage is likely to be done - as compared with the permanent damage Shell want to do by laying a high-pressure raw gas pipeline plus a toxic waste pipeline through the whole length of both Broadhaven and Sruwaddaccon Bays - not to mention the untold damage that would occur if the pipeline burst - as occasionally does happen. If a temporary camp is not allowed, how can permanent pipelines even be contemplated ?? Good report Conor ! Can it be taken as read that if this injunction is given that it will be appealed to the High Court ? The law seems to be the weakest link up there. The High Ct is an option if the council wins next Monday but I am not sure what they will do. Theoretically this could be brought to Europe but the camp need to decide if it's worth investing time and effort fighting this. Niall is chomping at the bit to get stuck in to this and judging from his great performance last Monday I am sure they will put up a robust challenge. This is just more Crap from Bertie's 'Green' Banana-less Potato Government. The message remains "Shell to the Sea, SHELL RIGHT OUT OF IRELAND and over the sea. Could we ban their hot air, in order to help with the global cooling and wet summer problem? Good work Neill keep up the pressure! This is just another example of the wasters in MCC trying to walk on our democratic right to object to their corrupt decisions. Democracy at street level is better than all the hot air of the "fat cats" in Castlebar and Dublin. Rather than them attempting to evict the camp, we should be tipping the goons in MCC out on their arse's, specifically the man who claimed there was no pollution from Shell at Ballinaboy the unelected gang! The EU is probably far too slow and remote in the short term for this case. But probably is the way to go in the long term and will help to highlight (yet again) the ongoing government corruption in Ireland. The EU know all about it since early 1990s but no harm to keep it boiling, maybe they might put a stop to Shell. Sock it to em Niell! MCC probably got it wrong, (lets hope)! Looks like more Police-State tactics to me. The late night raid, the unholy rush to criminalize, the insistence on "up holding the law", all reminiscent of the Fascist state. I question if MCC have jurisdiction over the foreshore in question because Dempsey exempted this foreshore from all planning and any foreshore is under the Admiralty division of the High Court (if I remember correctly). There must also be a question if the woman "expert" is really that expert or just some government lackey prepared to say what she is told to say. Experts normally reside in Academia, the EU already is unhappy with the activity of Shell and Ducus much more than the camp. Hope this helps! The civil case brought by Mayo Co Co has been adjourned to 3rd Sept 2007by consent with both the council and the camp. A deal negotiated by both parties to have only six people remain on the camp was dismissed by Judge Kenny. In granting the adjournment he imposed his own condition that no resident’s would stay at the camp. This order was later withdraw when he allowed two permanent residents stay at the camp on request. This order will come into place at 2pm on Friday 3rd of August. So can people still visit? Ho w have they definded 'permanent resident'? The amount of goodwill towards our solidarity friends that exists in the parish was very evident over the past few weeks since this issue emerged. They've stuck with us through thick and thin and we'll do the same for them. They won't be stuck for a place to stay if it's needed, that's for sure. It's ironic that the reason put forward to justify their eviction is that they might be causing damage to a candidate S.A.C. Hello, has everyone forgotten that their camp is sitting directly on the proposed route for a 345 bar raw gas pipeline? Apparently it's o.k to allow all the machinery, manpower, trenching and destruction involved in that procedure, but a few people living there constitutes a major environmental threat. Go figure. Shell have got egg all over their faces thanks to their non-transparent funding of Feile Iorrais, the annual cultural festival in Belmullet. Serious questions are being asked of the organising committee, and by implication, of Udaras na Gaeltachta. Meanwhile, many of the performers are stating openly that they are performing under protest becauce of Shell's involvement, of which they had'nt been made aware. Andy Irvine has pledged to donate some of his fee to Shell to Sea, a massive gesture for which we are hugely grateful. Shell have tried to counter the effects of a major P.R disaster by wheeling out John Egan. Unbelievably, the first thing he said was that Shell's name did'nt appear on the publicity info. because their contribution was so small. This is the same man who keeps telling us about the massive benefits this project is bringing to Erris. A contribution that's so miserable it does'nt even merit a mention just about sums up Shell's attitude to the people of Erris. But what a donkey Egan is to make a howler like that. Next out to bat was Andy Pyle, the only man in the world with a more annoying accent than Jar-Jar Binks. It must be 18 months since we heard from this failure. If he's being trooped out they must be in trouble. Now that the Petroleum Affairs Division has come clean and admitted that we are talking refineries and pipelines in the plural as well as the spectre of oil refining, many more people around Erris are beginning to rethink their attitude to this project. 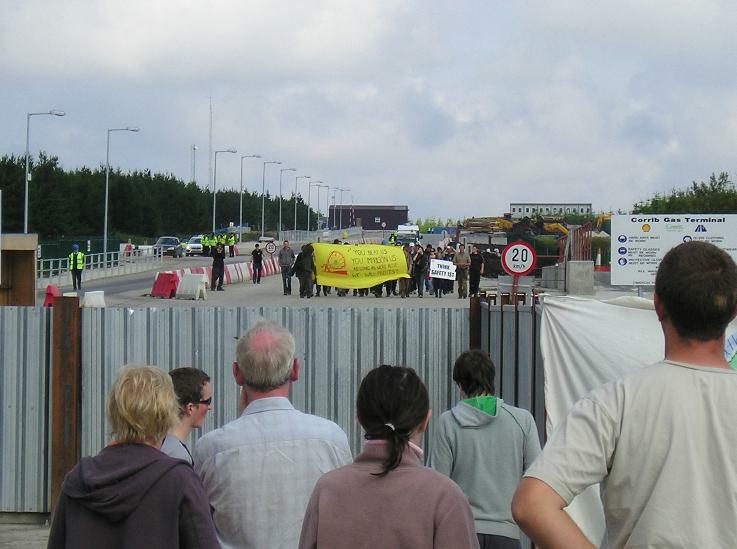 Shell and the Gardai have combined to create a sense of anger around Erris that's palpable. Now everybody knows what this is about, and as Shell falter in the good neighbour stakes, their task becomes all the more difficult. The challenges being brought in Europe add another dimension. It's a time for optimism and renewed commitment. This is a campaign that's there for the taking.Stay on board, everyone, and bring your friends. this is going to be one hell of a ride. 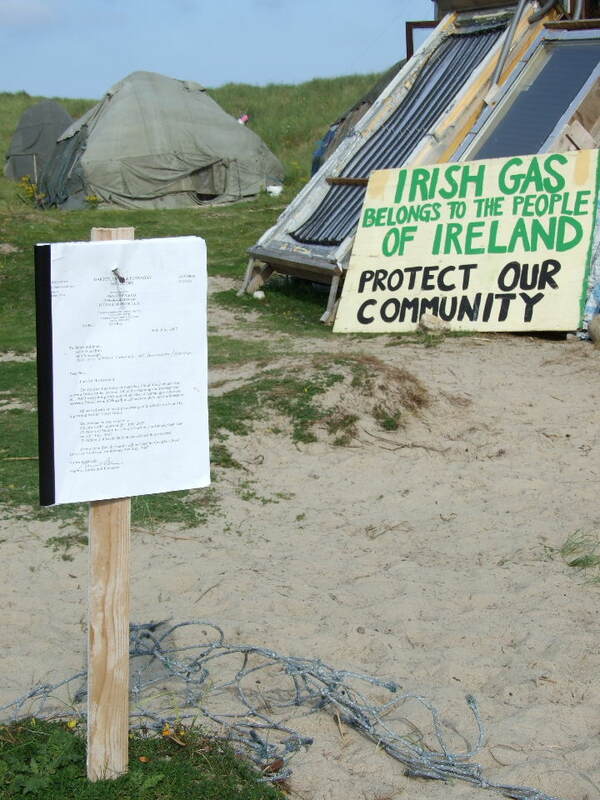 A Circuit Court judge has given opponents of the Corrib gas project a deadline of noon on Friday to vacate the Rossport Solidarity Camp in north Mayo. At a sitting of the Circuit Court in Castlebar yesterday, Judge Harvey Kenny set the timescale for the vacating of the encampment pending a full hearing on September 3rd of an application for an interlocutory injunction by Mayo County Council, which is seeking that the facility be closed down. The local authority maintains the camp is unauthorised and that it is causing "irreparable damage" to the local environment. At yesterday's brief hearing Seán Deegan acting on behalf of four defendants, Mark Robinson, Eoin Ó Leidhín, Bob Kavanagh and Niall Harnett, applied for an adjournment of the proceedings to enable him mount a defence. The judge later indicated he would agree to an adjournment on the grounds that nobody be allowed remain in the camp. He gave the camp occupants until noon on Friday to leave in order to allow "a reasonable packing up time", Mr Deegan said he had a difficulty with that in that "these people would be homeless". Judge Kenny replied that all he was asking for was the defendants to take their personal belongings out. He was not asking for the removal of any structures. He said he would allow one person to remain on the site purely for the purposes of security. Mr Deegan said two would be required for such purposes. Judge Kenny initially insisted that only one person be allowed on the site but relented when John Kiely, for the council, indicated the local authority would have no problem with two provided these persons were named. "No other persons are to occupy the site," Judge Kenny stated. "It is to remain vacant." Mr Deegan said Bob Kavanagh and Eoin Ó Leidhín would stay on in the camp for security. The full injunction hearing is now scheduled to take place on September 3rd at Castlebar courthouse. The solidarity camp was set up in 2005 and functions as part of the Shell to Sea campaign as a gesture of support for five local men who were in prison because of their opposition to the onshore gas pipeline. The council is seeking the four named defendants "cease the unauthorised use and development of lands" by erecting, maintaining and using tents and other structures and ancillary facilities for camping or habitation. 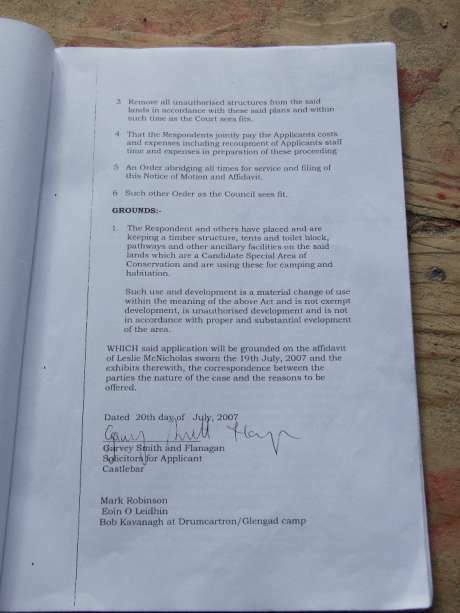 In an affidavit to the court, the local authority maintains that there is no planning application in respect of the camp and that it is being used as a base for those coming to the area to protest against the Shell gas project.